Give hope to those who are fighting MS, leukemia, skin cancer, or kidney cancer this holiday season. Christmas is a time where we fight for a miracle, and this ornament will give your loved ones the hope they need. 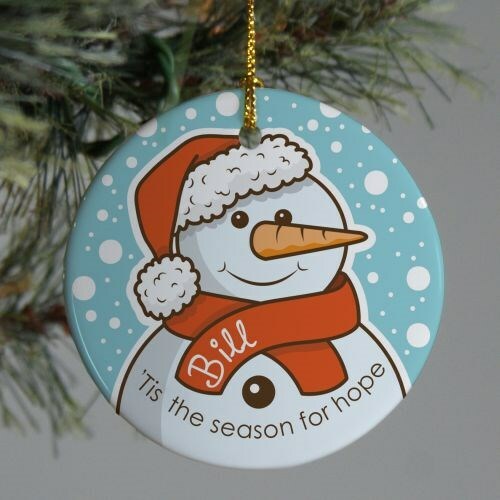 This "Tis' the season for hope" Ceramic Ornament is a flat ornament and measures 2.75" in diameter. The Ornament includes a ribbon loop so it can easily hang from your tree or ornament stand. Free personalization of any name is included. Beautiful- note that the personalization written on scarf if very light. Still nice tho. 'Tis the season for hope, indeed, and those struggling with MS, kidney cancer, leukemia, and skin cancer are going to need your thoughts and prayers this holiday season. This ornament will give hope and spread positive thoughts. Our Autism Ribbon Awareness Ornament is another best selling awareness ornament of ours.